It is indeed a scary and inconvenient truth which we refuse to acknowledge; a number of us lead a sedentary job-role which requires us to stare in front of a computer for long hours. Seated/cooped in small nest like cubicles. Exercise and fitness and healthy eating habits are very very important. Add to it - cutting down on nicotine and alcohol consumption. Susan, this is a very thought provoking article. Every body knows the benefits of walking, eating a healthy diet, still indulge in all such banned things. This should come as a reminder! Obese does not automatically mean unhealthy. If an obese female of childbearing age presented at my clinic passed out with low BP I'd at least check her thyroid levels - did these doctors? Totally true, Susan! I hear this from many women. You are thin; why do you need to work out? All their myopic brains can think of is exercising for weight loss. 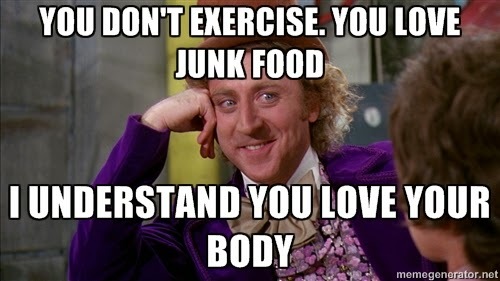 I mostly tell them I work out and eat sensibly to stay fit but it clearly makes no sense to them. Thank you for writing this. Surely, love yourself has been dragged a bit too far for our own good. I'm glad you brought this point up! A lot of people think I'm just a health freak and hate the topic of exercise altogether! It's not a question of just losing weight; just of being healthy!